Well this is very exciting, we have 60 members signed up, so that means over the next few weeks 360 small fabric circles will be stitched, made up into buttons and shipped around the world … and I can’t wait to see them all! Firstly thank you so much for all your emails, and as you all signed up so quickly I will be sending over your swap partners’ details sooner than planned. So expect an email from me within the next 3-4 days once I’ve paired you all up. Sorry if you missed out! I had a few people email after we reached 60 members, so sorry to all that missed out, but it doesn’t mean you can’t stitch along with us! 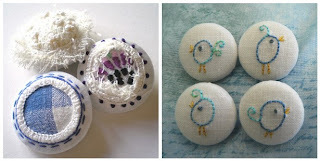 If you fancy having a go at making some embroidered buttons we’d love to see them! Just remember to tag any photos in the embroidery pool with ‘fsswap’ so we can find you! Next Saturday I will post the list of swap partners, but you will receive an email from me by Thursday (at the latest) with your partners' details. 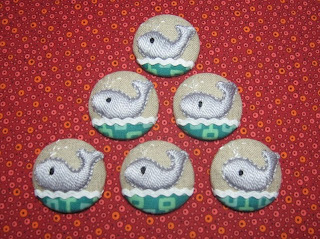 I will also be adding another tutorial showing how to make fabric buttons without squashing your stitches, as we all know how delicate those little french knots can be! I am sorry that I missed out on this swap! Do you plan on having any more this year?